Mayor Tom Rowland pointed out cities must meet the foundation's criteria to receive the distinction. 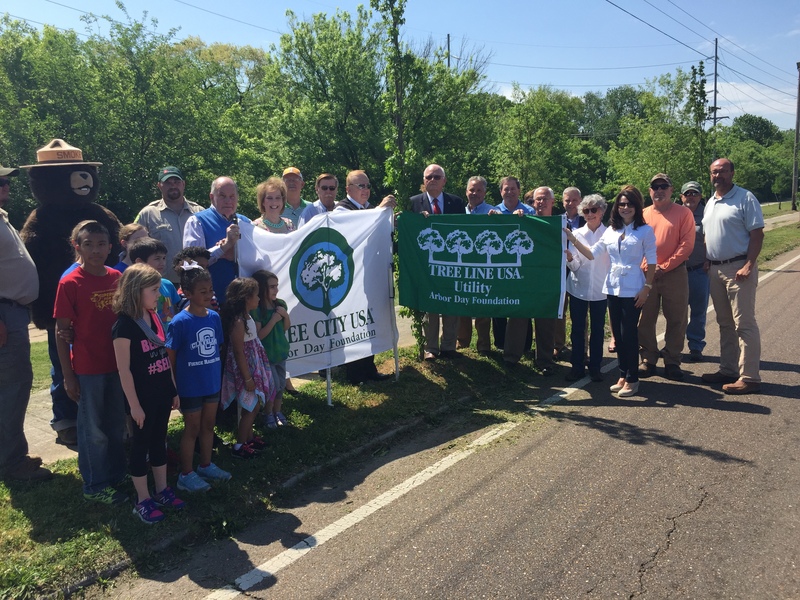 Taking part in the ceremony were members of the Cleveland Shade Tree Board, several City Council members, members of the Forestry Division of the Cleveland Parks and Recreation Department, Cleveland Utilities, Tennessee Forestry Division and city officials. Joining the celebration were students from Stuart Elementary School and Smoky Bear. Cleveland Utilities was recognized wth a Tree Line U.SA. award. It is CU's 16th annual award from the National Arbor Day Foundation. To win the award utilities must also meet foundation standards. Meanwhile Cleveland State Community College has also been recognized by the National Arbor Day Foundation. The college's eighth Tree Campus U.S.A. award will be presented later. Urban Forester Dan Hartman said plantings along Keith Street will continue to enhance the greenway and the streetscape. Shade Tree Board co-chair Amy Banks told the Stuart students the new trees are their trees for many years to come.